Textaizer Pro is a text mosaic creator with extensive possibilities to also create genuine ASCII art. 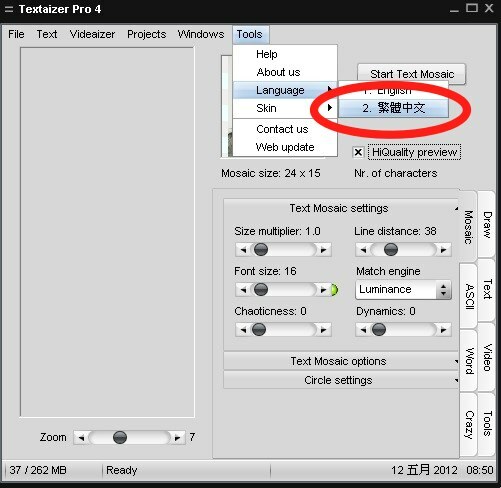 What can you do with Textaizer Pro? You can turn any picture into little pieces of art by re-painting its bitmap from a text. Simply choose a text file and the target picture and press the button. Hide your text in a picture and send it to your loved one as a 'secret' message. Or simply create and print balloons from 'happy birthday' words. Is Textaizer Pro a unique program? Yes. Many ASCII art applications can be found on the internet and also some text mosiac creators. Textaizer Pro is however one of the few programs that combines these two possibilities and above all it's freeware. And that makes Textaizer Pro unique.